Red Bull Green Edition is a kiwi-apple flavor variation of Red Bull Energy Drink. There are currently 7 other drinks in the Red Bull Edition lineup and they all have the same amount of caffeine per fl oz. Red Bull Green Edition is intended for healthy adults only. Sugar content: 38 grams (per 12 ounces). How Does Red Bull Green Edition Compare? 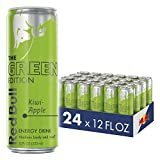 Red Bull Green Edition contains 9.50 mgs of caffeine per fluid ounce (32.12mg/100 ml).